The Vaishnava Saraswats of Northern Karnataka are the followers of the Matha. This Matha is Located at Partagali Village approximatley 1-3km from Cancona-karwar highway on the banks of the holy river Kushavati, Shri Saunsthan Gokarn Math was established by Shreernai Narayanateertha Swamiji in the year 1475 A. D.This place is developed as a hub for cultural activities and vedic teachings. The present Pontiff of this Matha is Shri Vidhyadiraj Theerth. Short Name : Shri Gokarn Math. Presiding Deity : Shri Ramadev and Shri Veera Vithal. Poojas : Three poojas, morning, afternoon and night being offered by Shri Swamiji. 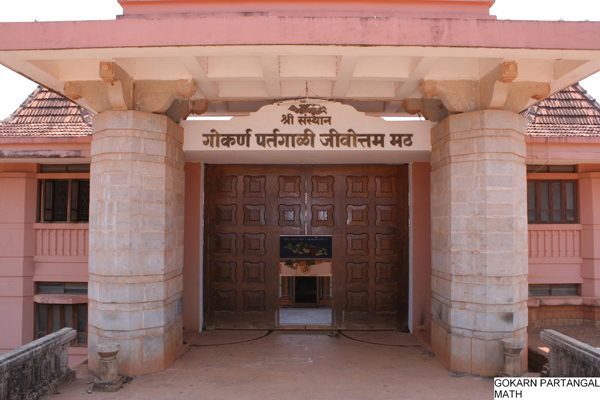 Established by : Param Poojya Shrimat Narayan Tirth on Chaitra Shukla Dwitiya, Shalivahana Shaka 1397 corresponding to 1475 AD. Present Swamiji : Shrimat Vidyadhiraj Tirth Shripad Vader Swamiji. 23rd in the pontifical lineage. Festivals and Fasts : As per the Hindu Lunar Calendar: Prominent among them Shri Gokulashtami, Shri Rama Navami and Chaturmas during rainy reason for four fortnights. Goa: Rishivan, Bicholim Madgaon and Vasco. Present Udupi District), 23rd in the pontifical lineage was given Sanyas Deeksha on 26th Feb.,1967 in Shri Ram Mandir Wadala, Mumbai by his illustrious preceptor, Shrimat Dwarakanath Tirth Swamiji, who brought Shri Gokarn Math to Mumbai as earlier there was no branch of the math in the city. Shri Swamiji ascended to gurupeetha on 5th April, 1973 and thereafter tirelessly working for the spiritual upliftment of the followers, the prime duty cast on the maths. Under his leadership quite a few old temples and math branches were renovated and rebuilt and Shri Swamiji revived in a big way the ancient-most mode of worship by yagas and yajnas and also by undertaking pilgrimages to holy places, including the ones in the remote part of the Himalayas. Interestingly though a particular yajna is performed in a particular place, Shri Swamiji organises in such a way that the young and the school going tiny tots as well as the old can participate sitting in their own home. For instance, in 1997, for “Koti” (one crore) likhita (written) Shri Rama Nama Japa Yajna, hundreds of note books in which thousands have chanted and written in their own handwriting the mantra, Shri Rama Jaya Rama Jaya Jaya Rama, arrived at the venue. The enthusiasm of the devotees was so great that as against the targeted one crore, 23 crore mantras arrived at the scene! This year, April, 2000 for the mammoth Shatakoti (one hundred crores – one billion) Shri Rama Nama Japa Yajna, organised in commemoration of the 525th Foundation Day of the Samsthan and Shri Swamiji’s Silver Jubilee of ascending the gurupeetha, a devotee could chant any number at home, keep a daily record in a card supplied by the math and send it over to Partagali where the yajna took place. “Among all the yajnas, japa yajna is the greatest,” so declares Gita and Shri Swamiji actually propagates it by word and spirit. Among many pilgrimages Shri Swamiji has undertaken, the most difficult was virtually an expedition to Shri Damodar Kund in the Himalayas about 20,000 feet above the sea level. Some 500 years ago the third Swamiji of the math, Shrimat Jeevottam Tirth Swamiji by whose name the math is called on account of his great many feats, had gone on a pilgrimage and Shrimat Vidyadhiraj is the second one to repeat this in the year 1998 traversing and climbing the snow clad peaks. The followers were deeply impressed by this accomplishment of their beloved guru and so they gave him the title of Abhinav (new) Jeevottam Swamiji! This year Shri Swamiji is undertaking another difficult pilgrimage, from Gangotri, the source of Ganga to Gangasagar where Ganga meets the sea. The math, in 1977 instituted an annual award called Shri Vidyadhiraj Puraskar to be given away annually to a GSB of outstanding performance in any field of human endeavour. So far 23 celebrities have been honoured. The latest recipient is Hon. Shri Suresh Prabhu, Minister for Chemicals and Fertilisers, Govt. of India. Shri Swamiji is a great Sanskrit scholar and all the GSBs can be proud of his accomplishments. He has mastered all the books on Madhwa Philosophy, Kavyas like Raghuvamsh, Kumar Sambhav, Kirartarjuneey and Nasishadh and also Jyotishya, Agama and Dhramashastras. He likes self-study and is fond of linking auspicious moments and stars to all his religious programmes. He is a lover of GSB History and Culture and always states that Gowda Saraswats are generous leaders with the spirit of service to all. Shri Swamiji has maintained a good two way communication with shishya varga and also friendly ties with other mathadhipatis. His greatest success is in making Shri Gokarn Math a vibrant and dynamic religious institution answering to the religious needs of the modern society especially popularising that great mantra of mantras, Shri Rama Nama, taking it to every home and heart. What more do we need in the modern world? Shri Ram Mandir Wadala is a prominent GSB Temple in the Central Mumbai. belonging to Shri Gokarn Math. The presiding deity is Lord Ram with Lakshman and Sita and just in front, across the road is a temple dedicated to Shri Hanuman. Shri Ram Mandir has many religious activities and festivals round the year, prominent among them Shri Ganeshotsav concluding on the day of Shri Anant Chaturdasi and then Shri Ram Navami festival for 9 days. It starts from the day of Gudi Padva and concludes on Ram Navami Day. This is called Navam when, on all the 9 days, round the clock, without any break, there will be a chanting of Shri Ram Nama-Shri Ram Jaya Ram Jaya Jaya Ram, by devotees. On the concluding day there will be a cradling ceremony for the infant Lord Ram when his idol will be kept in a cradle and this will be rocked by the ladies who assemble for the occasion in the presence of hundreds. The Mandir was consecrated by H.H.Shri Dwarakanath Tirth Swamiji, the preceptor of the present pontiff, H.H.Shrimat Vidyadhiraj Tirth Swamiji, who incidentally was initiated into sanyas here on 27th Feb.,1967.